A UPS includes a fairly large battery in order to provide backup power. The major benefit of plugging a printer into a UPS is that it can keep the machine running even when the power goes out. Some units also offer a feature called voltage regulation or line conditioning, which can regulate the voltage and protect against things like brownouts. 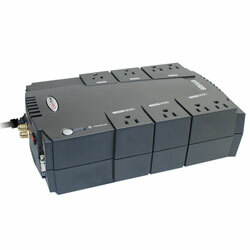 Most UPS units also protect against surges. The first disadvantage of a UPS is that they tend to be fairly expensive, due to the battery included inside, and the batteries tend to wear out over time, which means they will need to be replaced after a few years. The biggest disadvantage, however, is that many UPS units may not be able to supply enough power to run a printer, especially larger models which tend to draw hundreds of watts of power. For example, the HP LaserJet 5500, which uses the HP C9733A toner cartridge, is a high-wattage model that may be too much for many UPS devices to handle. Some Energy Star-certified devices are designed to use less power, however, making this more of an option. It is important to select a UPS unit designed to handle the type of load the printer will draw. You can use tools such as APC’s Surge Protection Selector and select the AVR option to help you choose. Surge protectors are designed to protect against spikes or surges of power, which can be caused by lightning or a malfunctioning electrical system. When the power spikes, sensitive components in a printer such as the circuit board can be damaged, leading to costly repairs or replacement. The main advantage of surge protectors is that they are fairly inexpensive, and some even come with a warranty that can replace damaged equipment if the unit fails to protect your equipment. As with UPS units, it is important to choose one that can meet the power requirements of your printer. The disadvantage is that a surge protector that has been damaged by a power spike or that is rated too low for your model might not supply enough power for the machine to operate correctly. For some HP LaserJet models, the unit may beep or display a “50.4 Error” message to indicate this type of problem. In this case, you should unplug the unit from the protector and plug it directly into the wall. If this resolves the issue, the surge protector needs to be replaced. The third option for plugging in a printer is to use no protection at all, but to plug it directly into the wall. When considering the many ongoing costs of using a printer, such as replenishing paper and replacing toner, it can be tempting to skip purchasing yet another item and save the extra money. Given the kind of damage that a power surge can cause, however, and the potential for a costly repair or even a replacement of the machine, it is not recommended. In summary, those who want their machine to be available at all times, even during a power outage, might want to consider a UPS device. 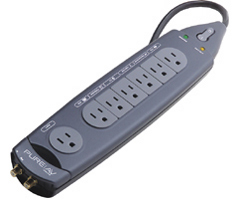 For the majority of users, a surge protector will provide good protection from surges without a high price tag. Whichever method you choose, make sure it matches your power requirements and you can rest assured that your investment is protected.